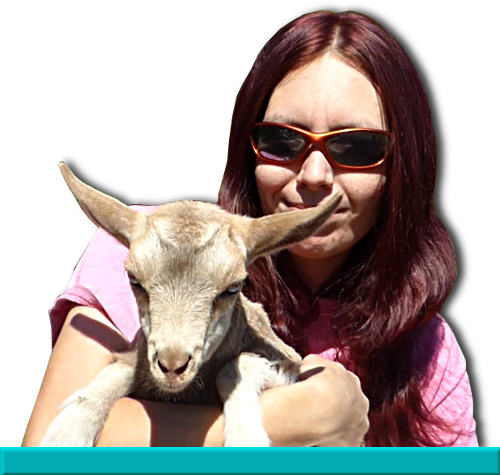 When it comes to hard luck stories, you’d be hardpressed to find a goat on our farm that has faced more challenges than little Alibi. Yet for all the troubles she’s found herself in, things always work out in her favor. It started immediately after birth – her mother was Mia, a very gentle and sweet doe that everyone loved. Unfortunately, the birth was a difficult one and Mia, who was on the older side, did not recover, leaving Alibi as an orphaned bottle baby. Around the same time, Mia’s oldest daughter Jojo also gave birth. Jojo had triplets, and all three went to new homes fairly early. These were supposed to be Jojo’s last kids, signaling her entry into retirement. (They turned out not to be, and Jojo later manage to sneak a pregnancy past me and have one last son, but that’s another story.) Jojo however is not a fan of being kid-free, so she continued to insist on being allowed into the kid pens, even after hers were gone. And before we knew it, she had taken tiny Alibi as her own. I personally was very pleased – one less bottle baby! And it was absolutely adorable, the older sister stepping up to care for her sibling after the mother has passed. Sure, a ton of anthropomorphising, but it was a nice thought and still is. They were joined at the hip instantly, the long bearded lady and the incredibly naughty kid. We always have a “teenager gang” made up of weanlings that make a great deal of trouble instead of staying in their pasture, and I’m sure you can guess who was the leader the year Alibi was born. She made no end of trouble, from breaking into the garage to tap dancing atop any car parked in front. The fencing was just a suggestion and more than once the gate was opened by someone – so much so that we started tying it closed. Yet I wasn’t the only one who would get annoyed with her – she was so incredibly pesky that even the other goats grew tired of her shenanigans. After harassing one grouchy doe a moment too long, Alibi lost a chunk of one ear. Thankfully it healed without issue, but it remains a long lasting symbol of her ability to drive a soul to near cannibalism. But the toughest of Alibi’s troubles was still to come. As a weanling, she was up to her old tricks, this time playing in the driveway with the other kids. It was nearly time for milking so time for all of the goats to go back to the barn and pasture. When I came back to shoo the kids along with the rest, I found poor Alibi in the most wretched state and in need of immediate rescue. She had been jumping onto the truck’s bumper then leaping off – but this time, she caught her back hoof between the bumper and license plate, and was now hanging by one leg. She didn’t even make a sound! I hurried over and extracted her, heart sinking. It was very obvious that her leg was broken, and her hock turned completely the wrong direction. Thankfully it was a closed break – there was no injury to the skin. We headed straight to the vet to see what could be done. The whole trip there, Alibi sat very quietly in my lap, and when I put her on the table at the office, she laid on her side and did not struggle. When the vet and I worked together to put the leg back into place, she only made a soft noise. Several weeks of crate rest followed, but Alibi recovered very well. Today you would never know she’d busted her leg so badly, and there’s only a small hard lump to be felt, if one knows where to look for it. She and Jojo remained close all the way until Jojo’s passing, and now Alibi herself is a mother, producing a big single doeling that looks a lot like her for her first kidding. She is also fast becoming one of the dominant does in the herd, though she’s still young and has a lot of growing and fighting to do to get there. Yet she probably has the highest number of recorded fights on our Youtube channel, challenging everyone from larger La Manchas to month old kids. As much as I would like to say that her penchant for trouble has ended – alas – she is definitely one of my worst behaved first fresheners on the milking stand!